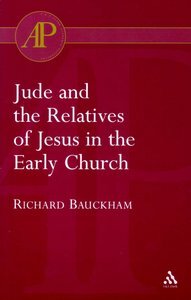 Dr. Bauckham assembles and assesses all the evidence for the role which relatives of Jesus played in the early church for the first time. The wide range of evidence used comes not only from the New Testament but also from the Church Fathers, the New Testament Apocrypha, rabbinic literature, and Palestinian archaeology. The letter of Jude, in particular, proves to have much to teach us about the theology of the brothers of Jesus and their circle. It illuminates their exegetical methods and their christology and shows both to have been influential contributions to the development of early Christianity. About "Jude and the Relatives of Jesus in the Early Church"